I don’t normally honor Bast, but I have some friends who do, so here are some hymns and praises to Bast, Eye of Ra, Lady of the Ointment Jar, Lady of Perfume, Mistress of the Sistrum and Strong Lady. 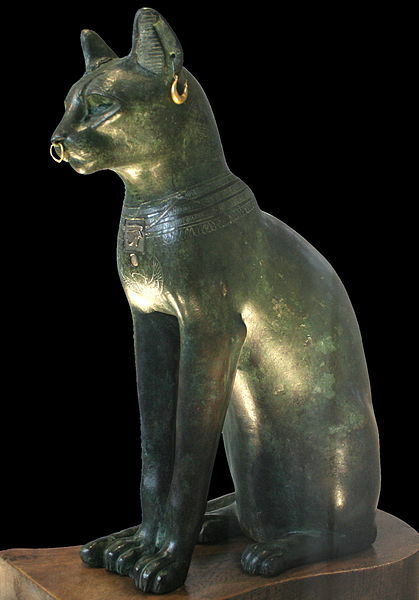 Bast means “she of the ointment jar” or “devouring lady” (1). She is a lioness and domesticated cat goddess of protection, the sun, the home and an Eye of Ra. To learn more about Bast go to these websites Per Bast and the wikipedia entry here Bast Wiki Entry. There is also a book about Bast called Bast, Cat Goddess of Ancient Egypt by Linda Illes. The book apparently has more information than has been previously published in English. And here is a great song to Bast by Catfolk: Bast Within and ShefytBast’s songs to Bast here: Songs to the Netjeru. Offerings to Bast include fine wine, beer, chocolate, water, fruit, fruit juices and meat. Her colors are green and gold. Also other solar colors could be used for her including orange, yellow or red as the avenging Eye. Black can be one of her colors as well. Mut, the Great Lady of Isheru (1.5). Lady of the Shrine, Daughter of Heru, Residing in the Holy Field (Bubastis) (2). Lady of Heaven, Mistress of Both Lands (3). Lady of Per-Bast, Daughter of Ra, Queen of the Sky, Who Rules over all the Gods, Great One, Lady of Per-Bast, Priestess Heri Sesheta of Tum, Only One, Who has no descent, the Goddess of the North, Who rules (4). Bast, Lady of Bubastis, Eye of Ra, Mistress of the East, who protects Her beloved son, Heru Hekenu, Mistress of the Birthplace of Her beloved son (5). Richly adorned in God’s Land (6). Anat, who protects Her son Heru (7). Passing scatheless where Your fires glow. Lies in the darkness ‘til Your light appears. Bast, beloved, banish all our fears. No gods existed ‘til You came there and gave them life. Sekhmet of the boat, the wicked fear You. Trampling down all evil and all strife. Bast, beloved, Mother of us all (8). 1) Siuda, Tamara. The Ancient Egyptian Prayerbook. Stargazer Design, 2009. page 62. 1.5)Goyon, Jean-Claude. Confirmation du Pouvoir Royal au Nouvel an : Brooklyn Museum papyrus 47.218.50. (Institut Francais D’Archeologie Orientale et Brooklyn Museum, 1972), 67. Translated by Chelsea Bolton. 2) Edouard Henri Naville. Bubastis (1887-1889). (London: Kegan Paul, Trubner and Co. 57 & 59, 1891), 58 . 3) Kitchen, Kenneth Anderson. Ramesside Inscriptions: Merenptah and the Late Nineteenth Dynasty: IV. (Blackwell Publishing, 2003), 251. 4) Edouard Henri Naville. Bubastis (1887-1889). (London: Kegan Paul, Trubner and Co. 57 & 59, 1891), 58 . 5) Junker, Hermann. Der Grosse Pylon des Tempels der Isis in Phila. (Wien: Kommission bei Rudolf M. Rohrer, 1958), 256. Translated by Chelsea Bolton. The form of Heru that was Bast’s son was Heru Hekenu “Heru of Praises”. Even though the translation said Harpokrates, “Heru the Child”. Heru Hekenu was the form of Heru most associated with Bast so I put Him here. 6) Junker, Hermann and Eric Winter. Das Geburtshaus des Tempels der Isis in Phila. (Wien, 1965), 35. Translated by Chelsea Bolton. 7) Junker, Hermann and Eric Winter. Das Geburtshaus des Tempels der Isis in Phila. (Wien, 1965), 391. Translated by Chelsea Bolton. 8) Murray, Margaret. Egyptian Religious Poetry. (John Murray Publishers, 1949), 103. BOD 164. Awesome! Thank you for collecting and sharing these. You’re welcome! I think Bast is awesome!